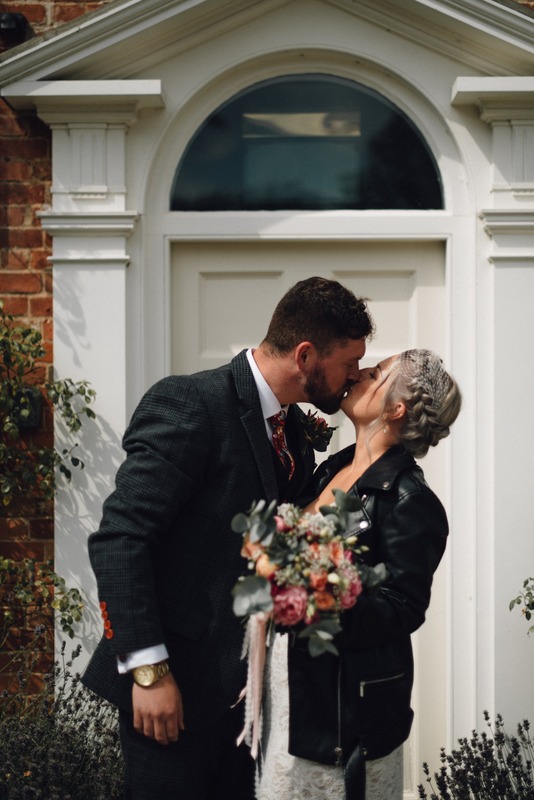 Inseparable pub quizzers, Jess & Greg create a Dapper-meets-Bohemian vibe for their day focusing on comfort and fun. 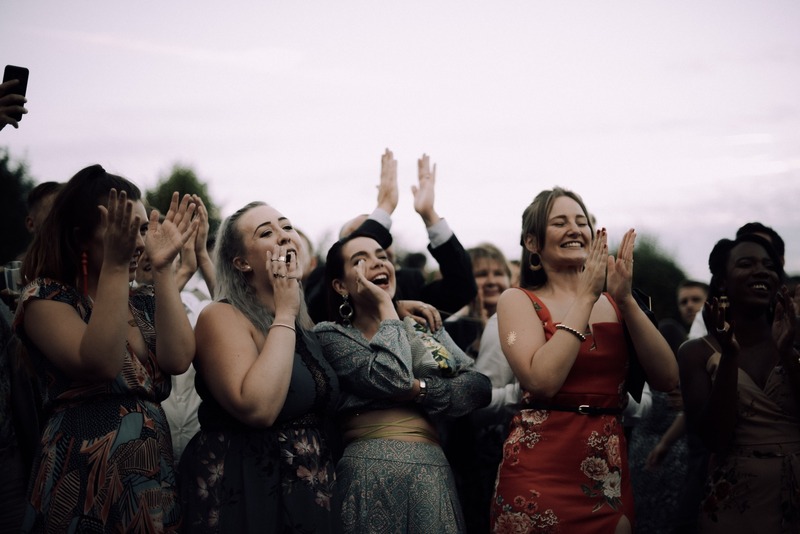 Think chillled & personalised entertainment, featuring an acoustic ceremony and bespoke evening playlist tailored by DJ Markus. 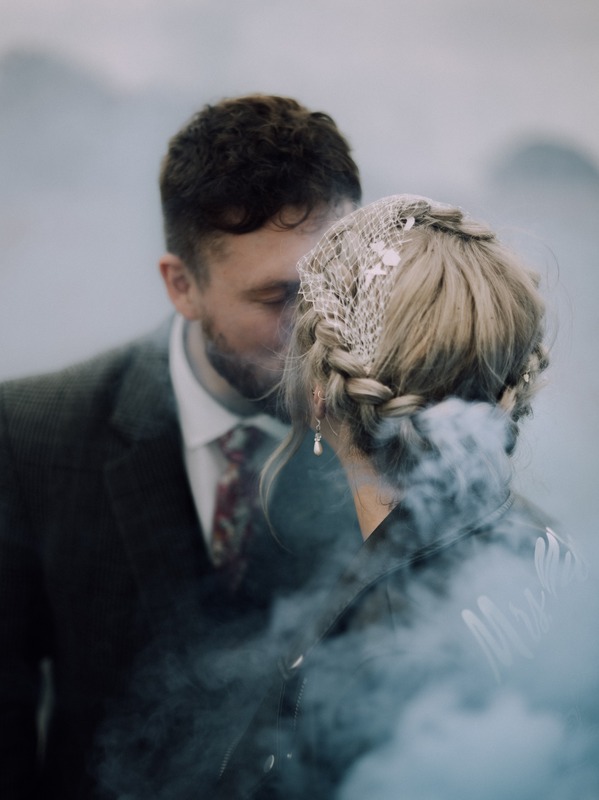 Plus lots of non-trad touches to infuse a bit of boho cool into their outdoor summer wedding – from the dreamy lace gown, macramé-inspired handpainted leather jacket, to the temporary tattoo bar, mix-your-own gin bar, & red heels that play second fiddle to Jess’s dancing Converse! 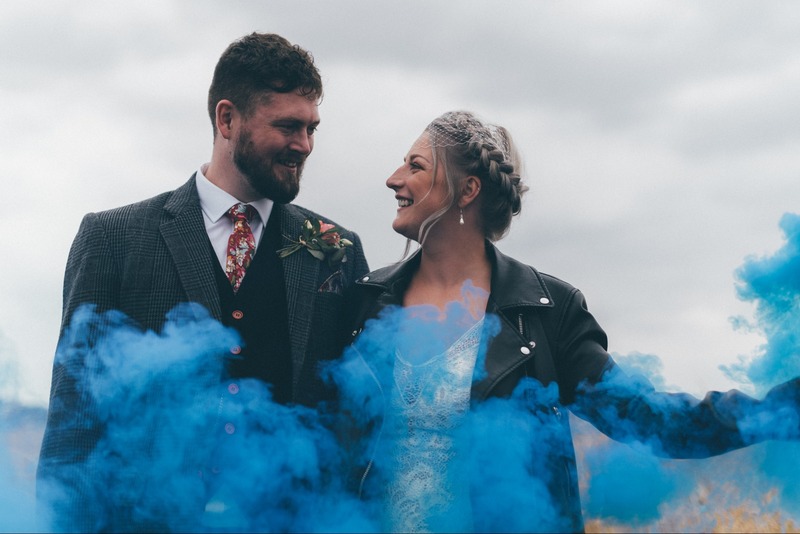 Then there’s the (literally) smouldering photoshoot... Sharp shooters Jonny Noakes & Rachel Di Cioccio capture the colourful vibes at Wethele Manor. 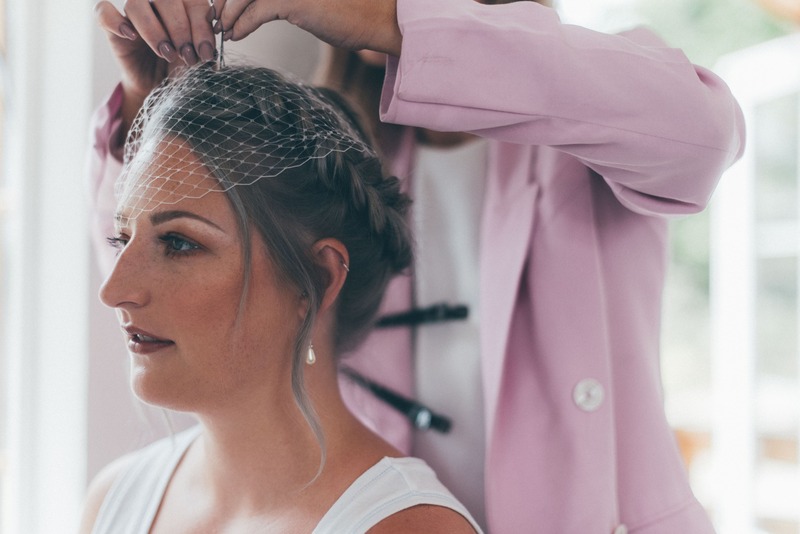 “During the ceremony, my step-sister and her husband played some acoustic music for us while we were signing the register. “For our evening reception, we found DJ Markus on Alive Network’s website. 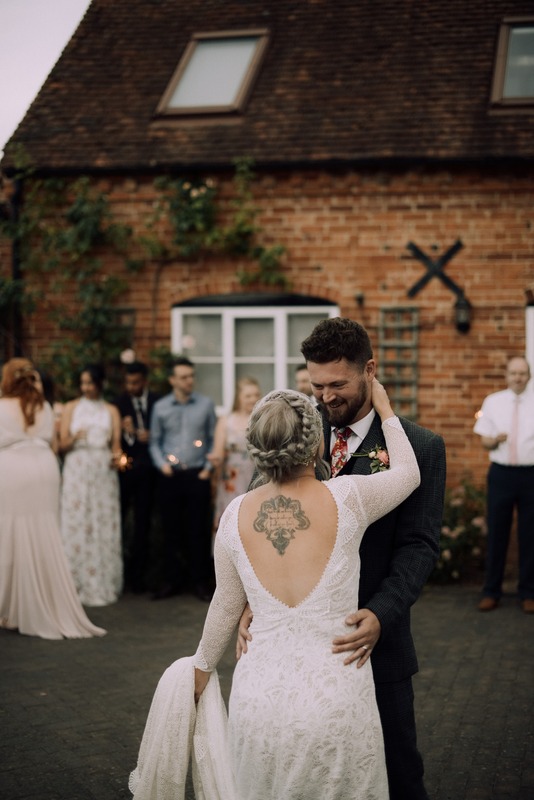 He had great reviews and seemed open to tailoring the music to the couple – perfect for us as we have very specific music tastes. 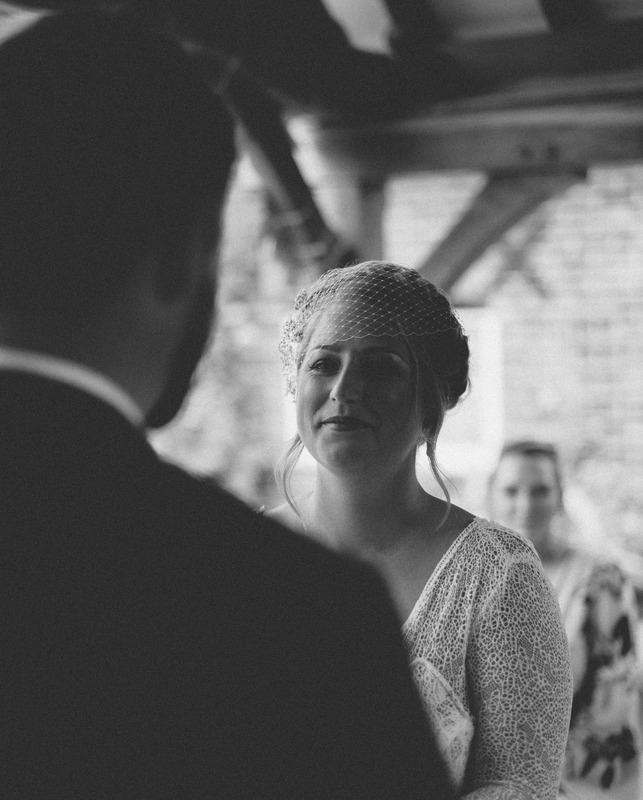 “For us, music played a huge part of our wedding and was planned for all parts of the day. 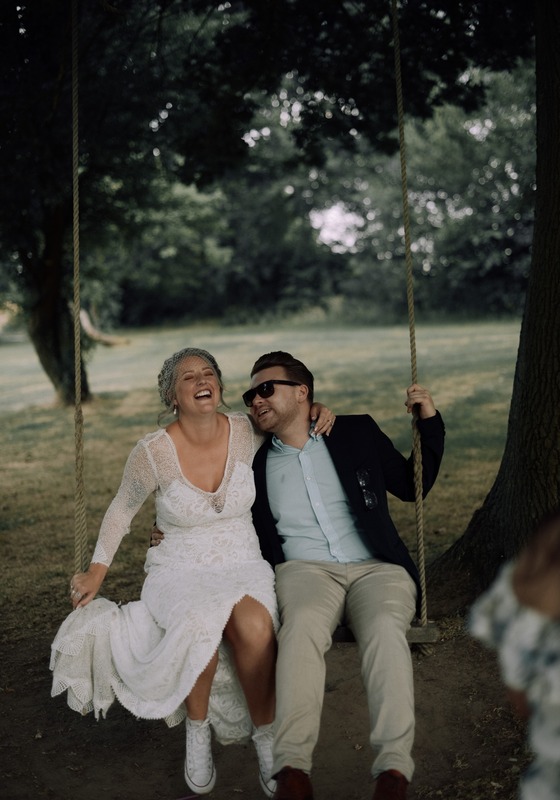 For before the ceremony, we had created a playlist of all our favourite ‘love songs’, some fast and some slow, but all with lyrics that meant a lot to us. This included all sorts of artists and bands including Clean Cut Kid, The Stone Roses, Kodaline, Mumford & Sons, and Queen. 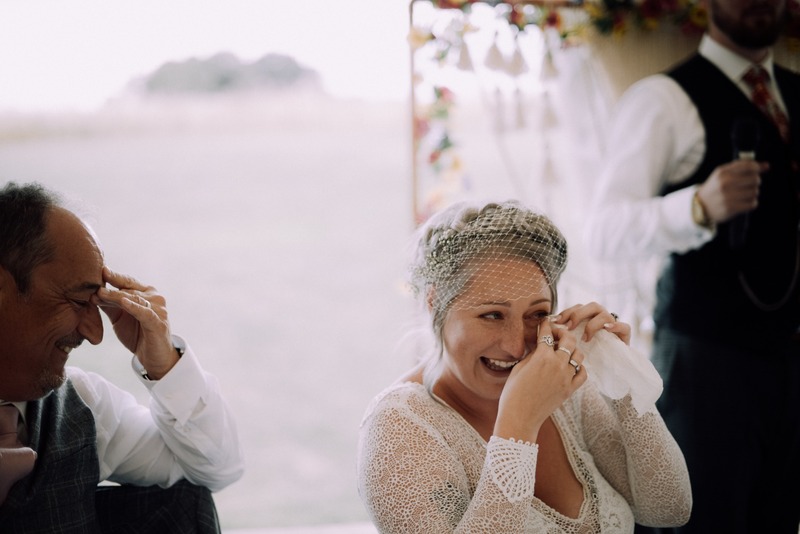 “I walked down the aisle to a symphony orchestra cover of the song ‘If I Had Words’ (yes, it’s the one the farmer sings in Babe!). 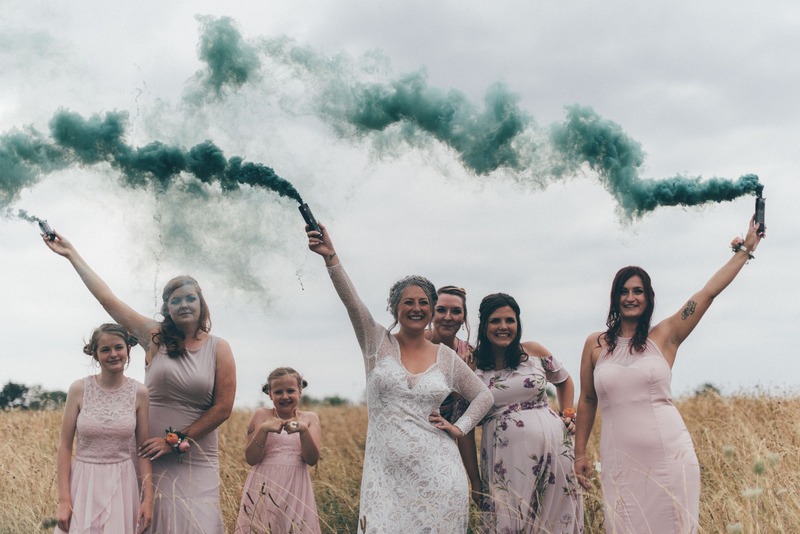 It was perfect – the tempo was great for my bridesmaids to walk in to, building to a big dramatic finish…I like to make an entrance! 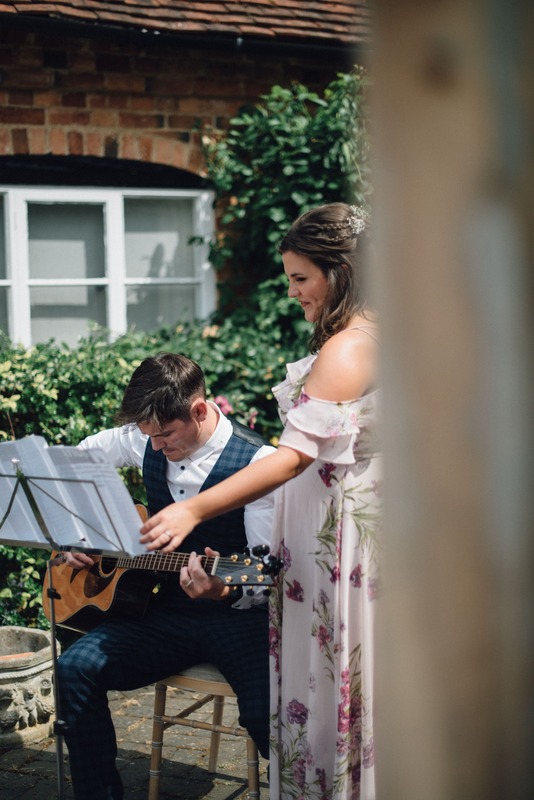 “While we were signing the registers, my step-sister Rachel and her husband Rich performed an acoustic version of A Million Dreams from The Greatest Showman – it was stunning! 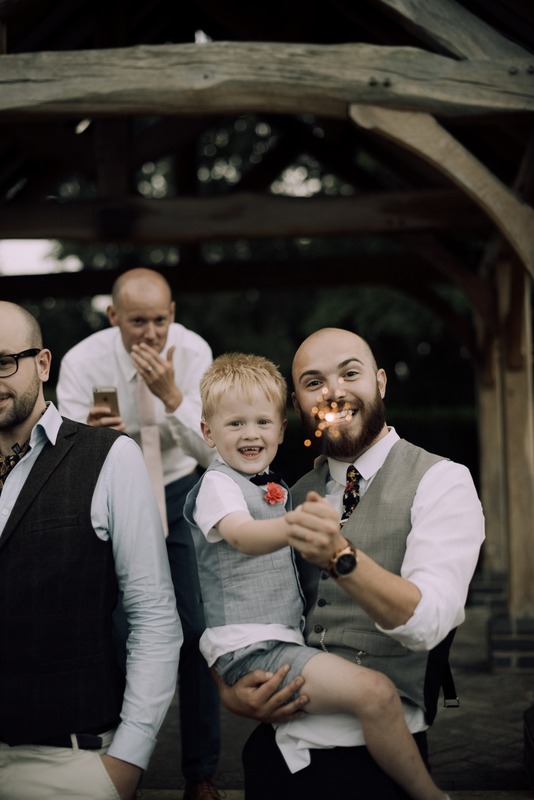 “We walked back down the aisle to I Believe In A Thing Called Love by The Darkness, to get the party started with a bang. 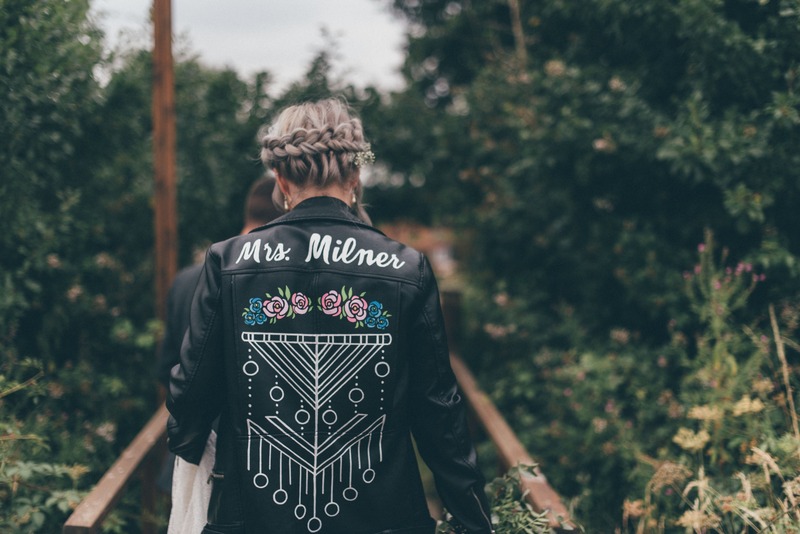 At this stage I donned my hand-painted leather jacket with ‘Mrs Milner’ on the back. 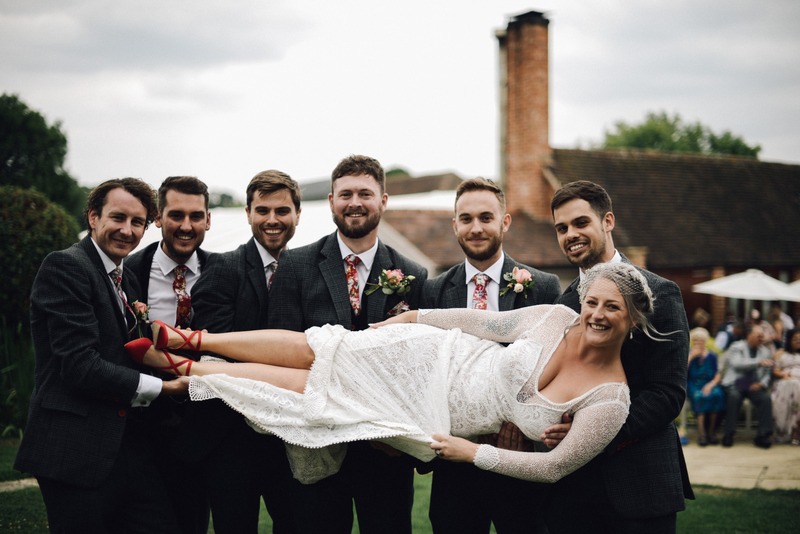 “During the drinks reception and throughout the wedding breakfast we had a playlist on the go, with all our favourite songs including I Always Knew by The Vaccines, Sweet Disposition by The Temper Trap, and Small Bones by Courteeners. 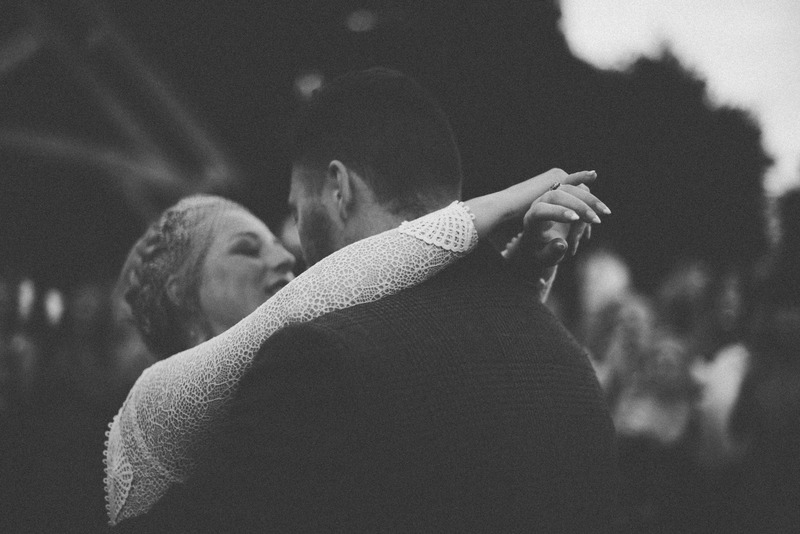 “We had our first dance outside with sparklers, to One Day Like This by Elbow. DJ Markus then played into the night. 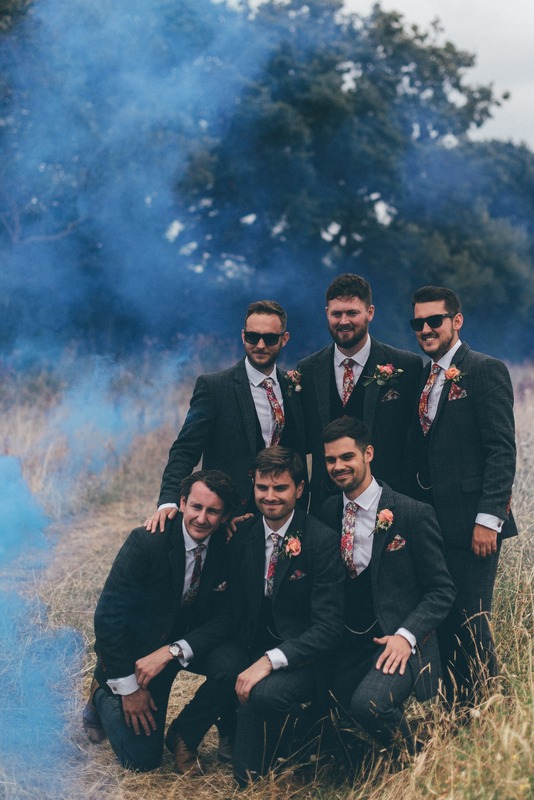 He tailored our very own playlist with all our favourites – some uni classics (cheese! ), and he catered to some requests too. 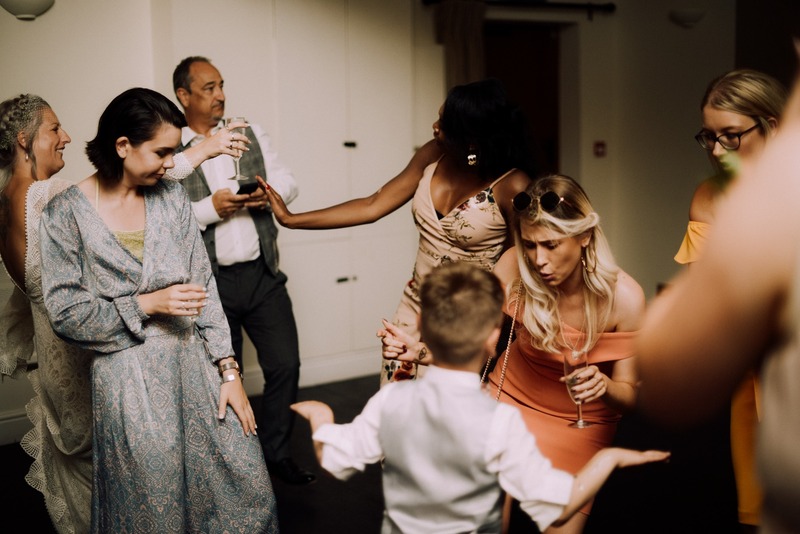 Everyone had a great time – especially my girl friends who like to GET DOWN! 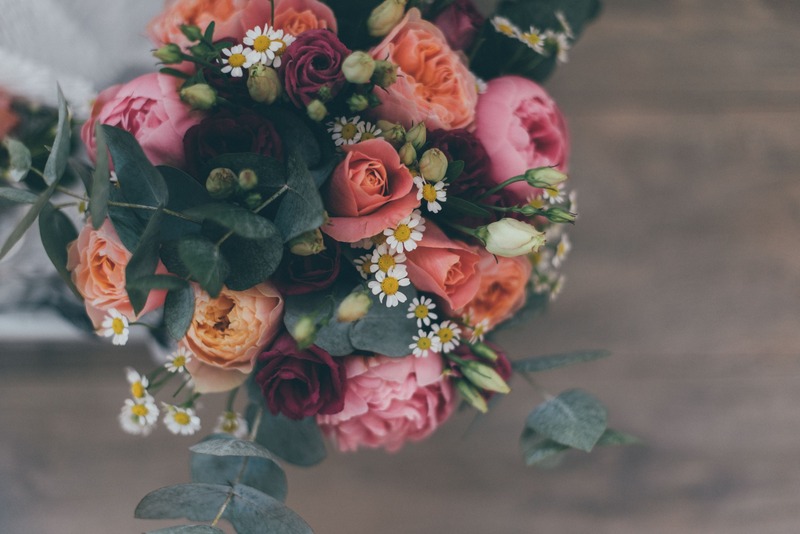 Check out these boho wedding music & entertainment ideas for your own dapper day. 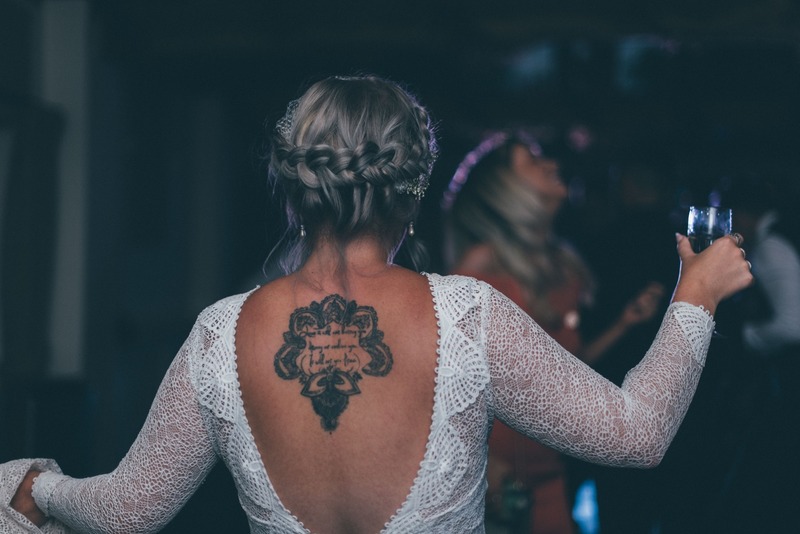 Your DJ needs to understand your music tastes to create the right vibe, specific to you. Curating a spotify playlist or a list of songs paints this picture best. Any ‘must have’ and ‘must not have’ tracks will become obvious and it’s your choice as to how prescriptive you want to be. 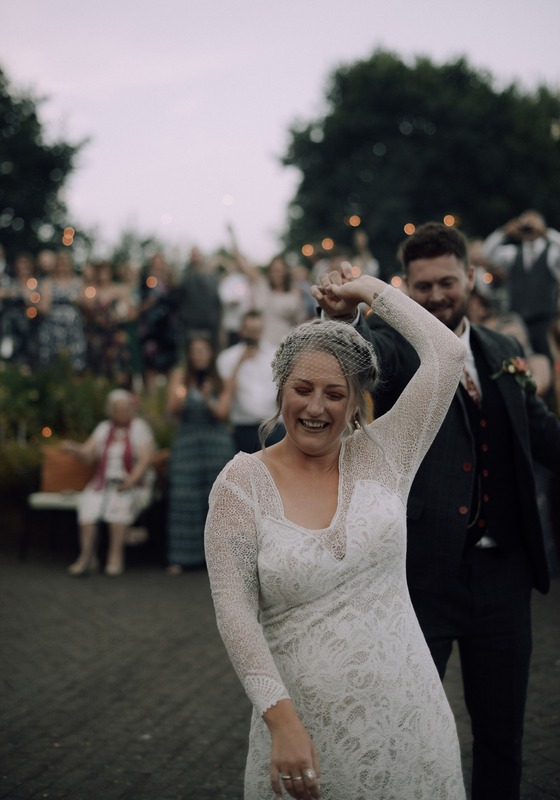 Jess & Greg knew what they wanted but also wanted me to trust my gut, which always works best; within 20 minutes your DJ can get to know your crowd well! 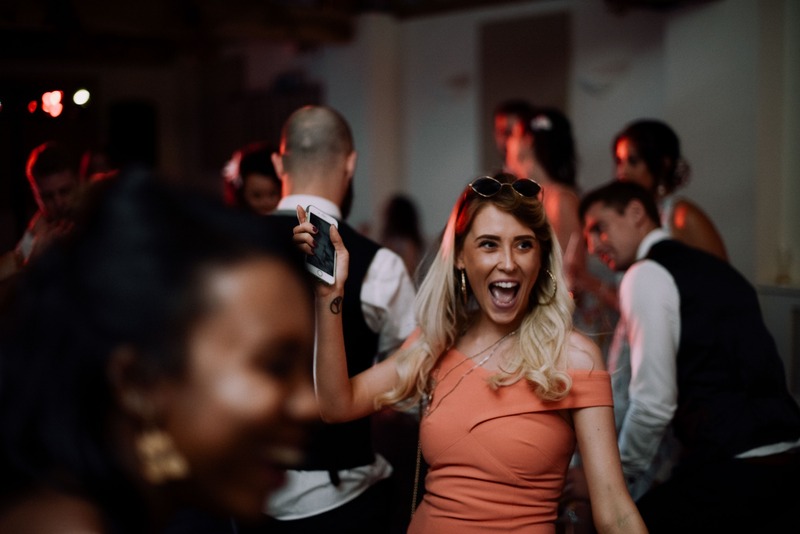 Make sure your DJ is comfortable with and knowledgeable about the music genres you want – if you love house music, R&B, chart, or garage, it’s important you have a DJ who can mix and who’s up-to-date with those genres. 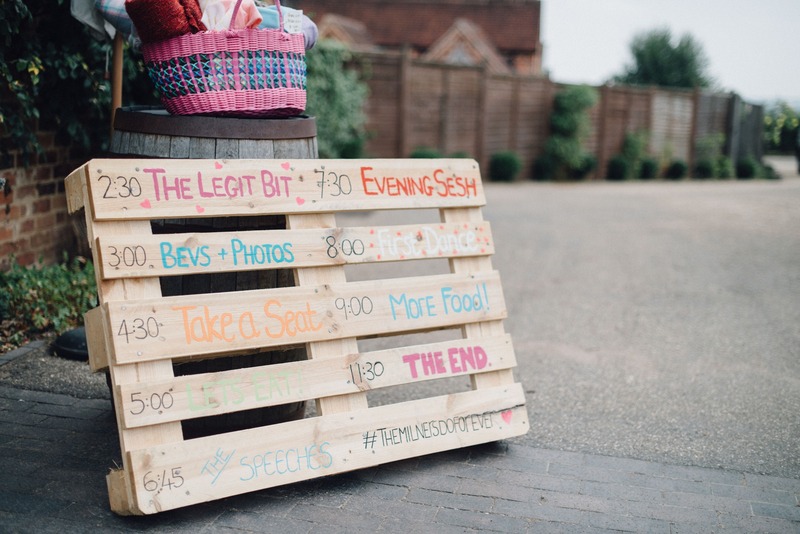 My biggest tip is try to keep everything in one room, be it the bar or photobooth, to keep the night fluid. 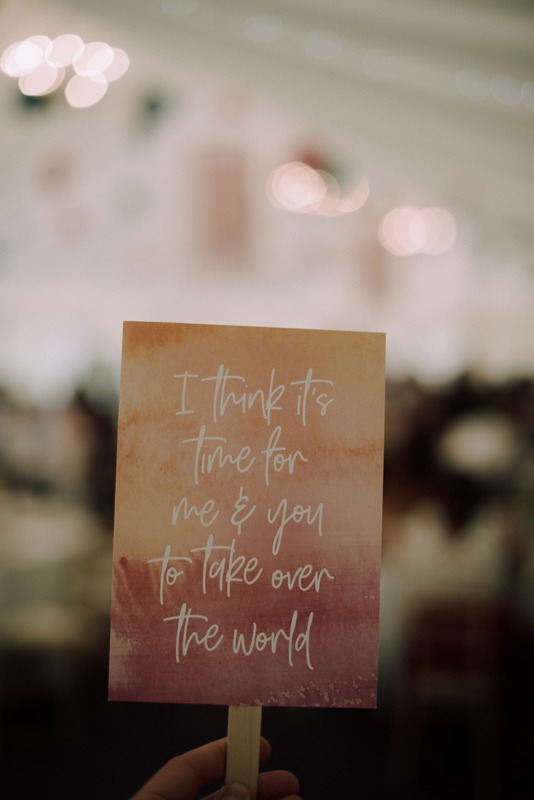 Announcements should be limited to the cake cutting and first dance and not much more...too many can just kill the mood. 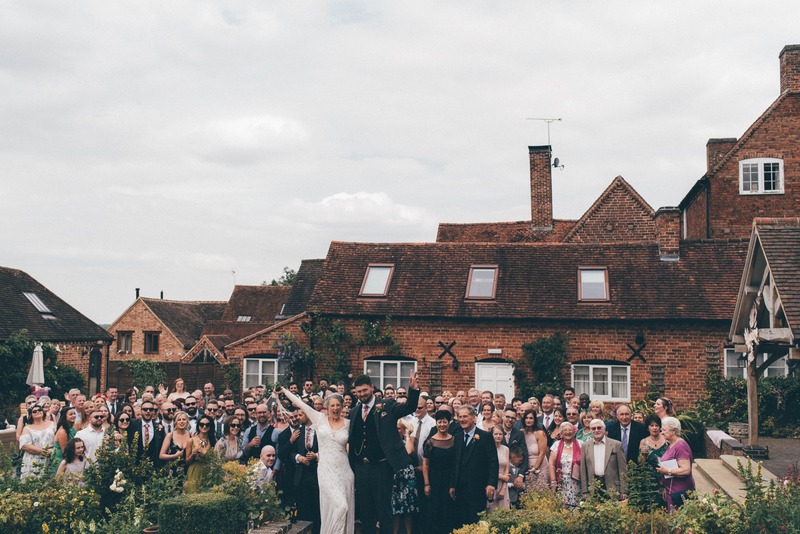 “Wethele Manor was the perfect venue for us. 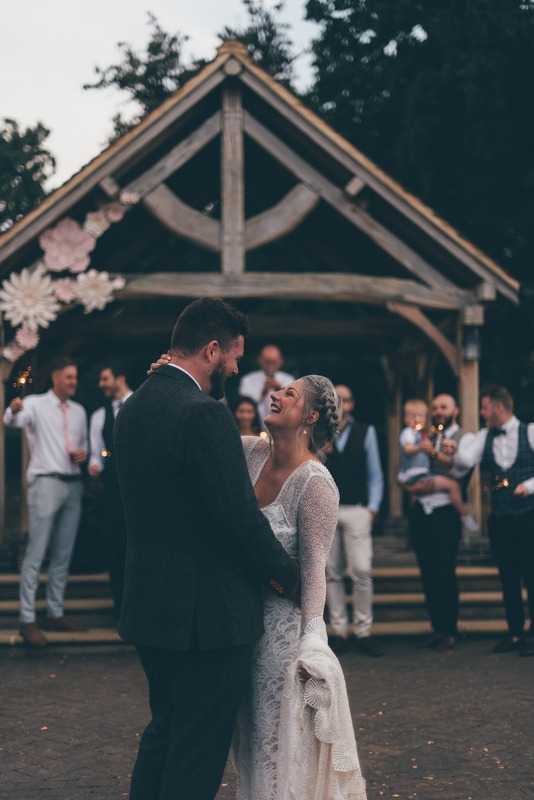 We knew we wanted an outdoor summer wedding as soon as we saw the Orchard Bothy, we were sold. 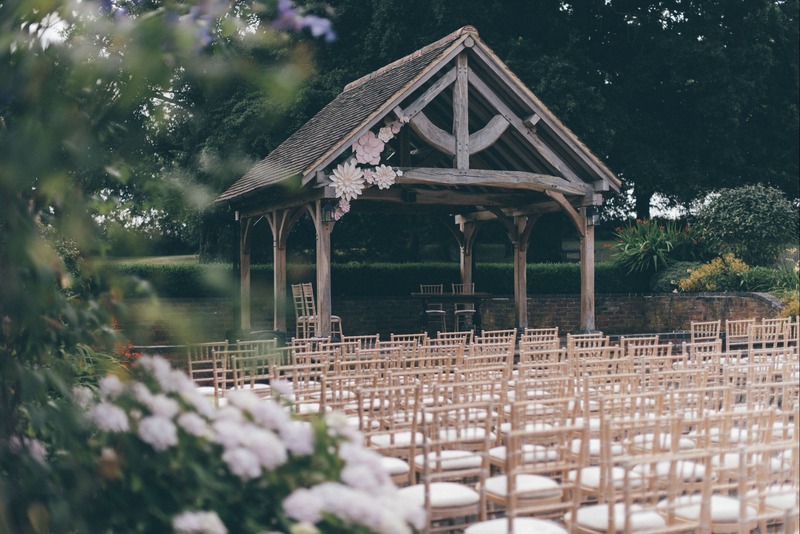 The surrounding grounds and countryside gave the venue a lovely outdoorsy and secluded feel. 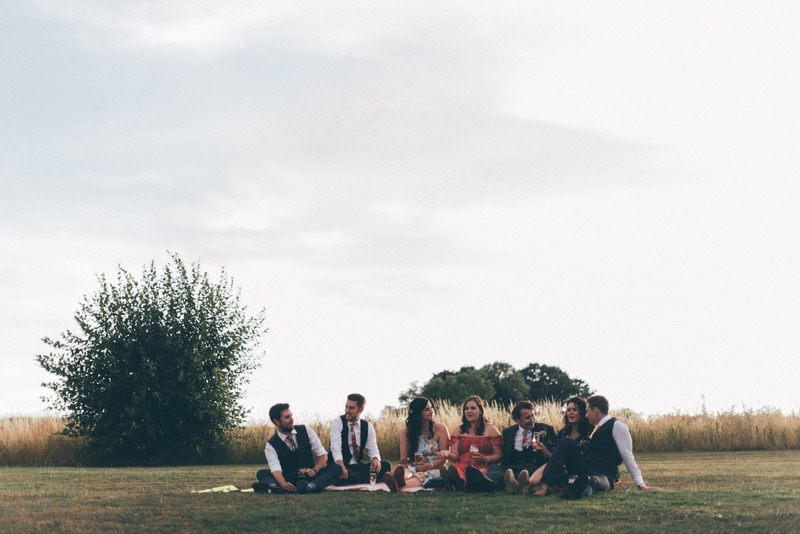 Explore these 50+ awesome entertainment ideas for your outdoor summer wedding. 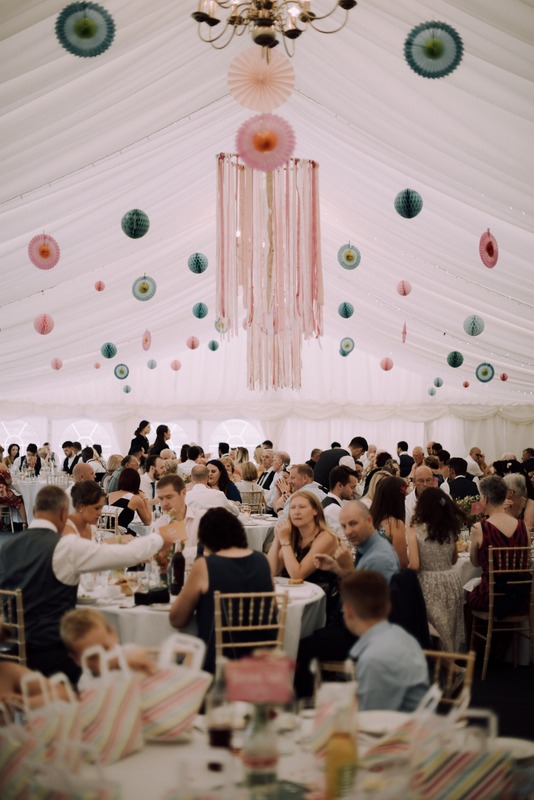 “The décor was my BABY and I loved planning every detail. I wanted it to be colourful, bohemian and unique. 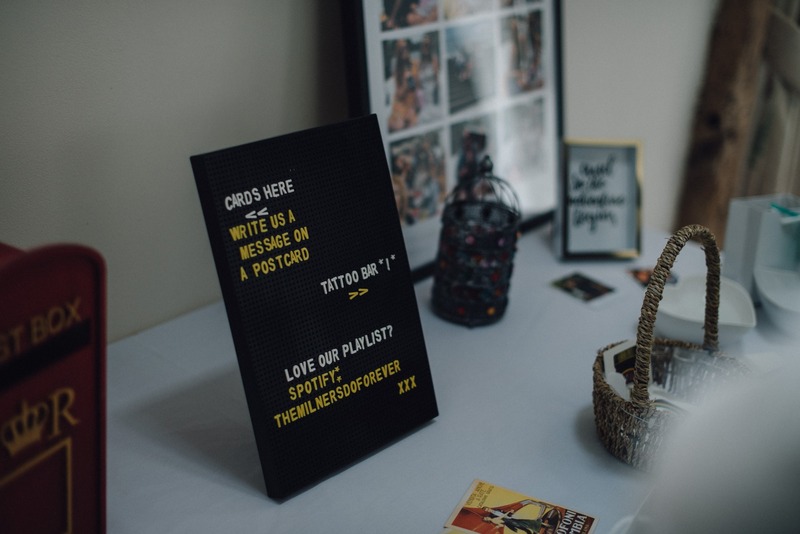 I spent a long time collecting and making things and used Pinterest to save all my ideas. 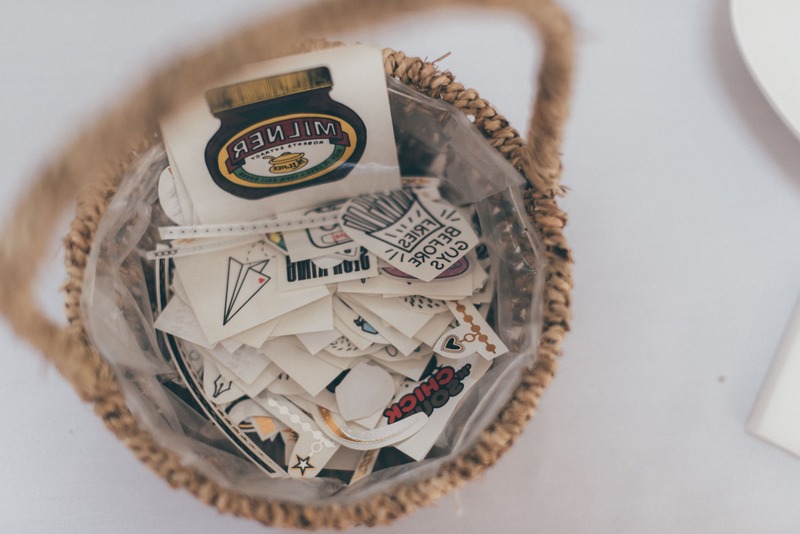 I tried to inject some cool elements you don’t always see at weddings, for example, a temporary tattoo bar. I work for a design agency and the guys at work gifted me with a whole batch of personalised tattoos they had made and printed on the transfer paper. 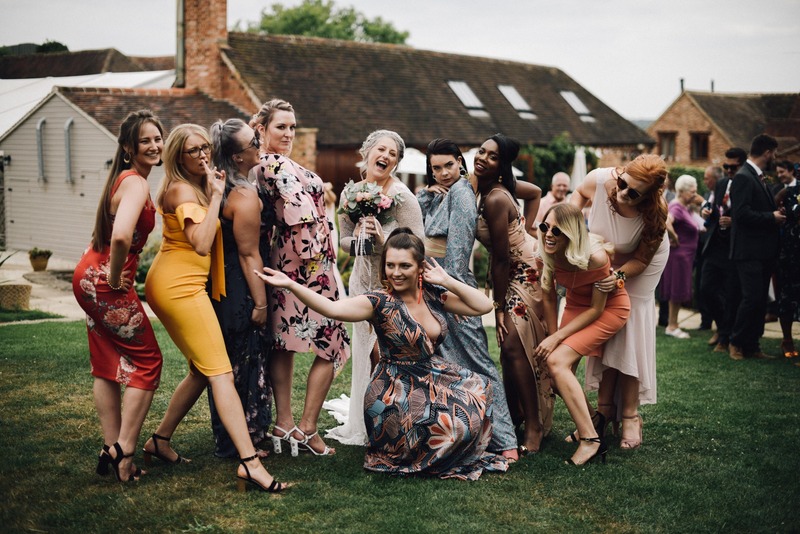 “On our wedding invites we said, ‘Dapper & Bohemian – check suits, shoes with no socks, floaty maxi dresses and floral headpieces are greatly encouraged!’ and people really did go for it! 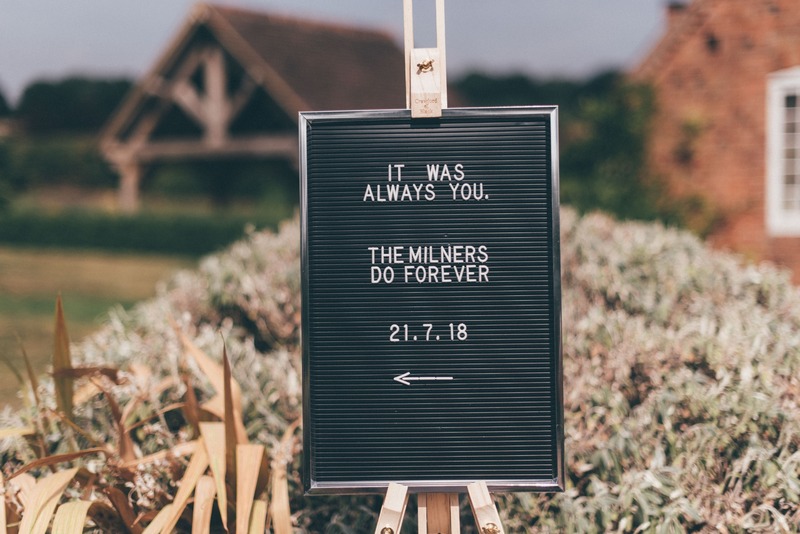 We didn’t want the wedding to be themed, we just wanted to give people an idea of the ‘vibe’ of the day. 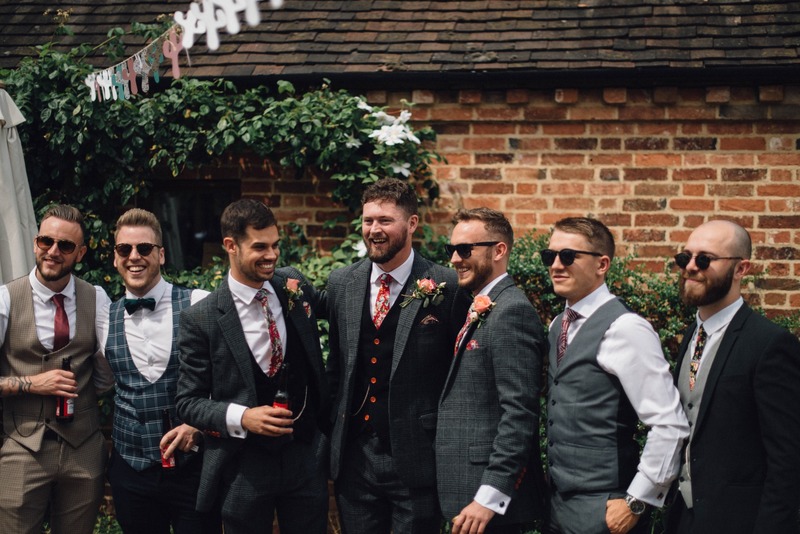 Our friends are SO stylish and they went alllll out to fit the vibe. 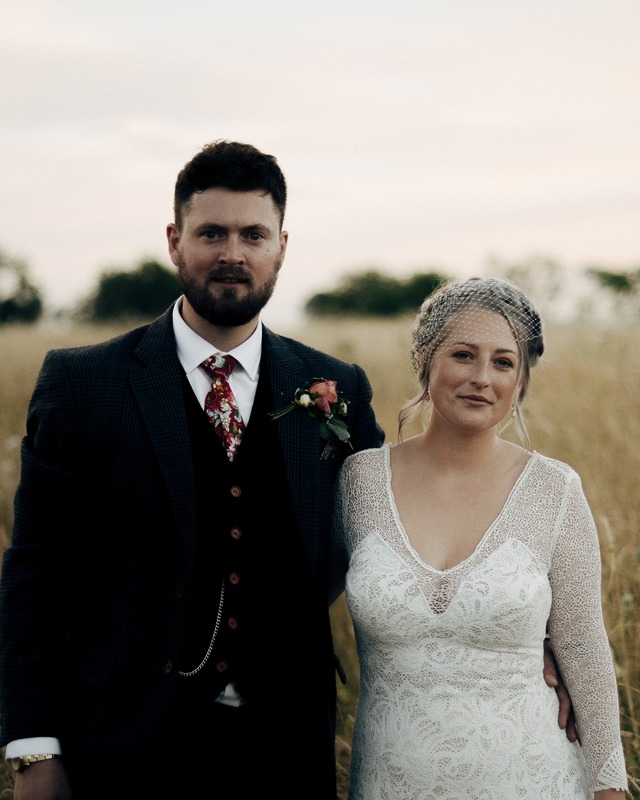 “My dress was from Grace Loves Lace which was a dream come true; I always told myself I would have one of their dresses. I opted for some red shoes from Kurt Geiger to wear for the ceremony and photos. As soon as they were over, I switched into my Converse and spent the rest of my day beyond comfy! 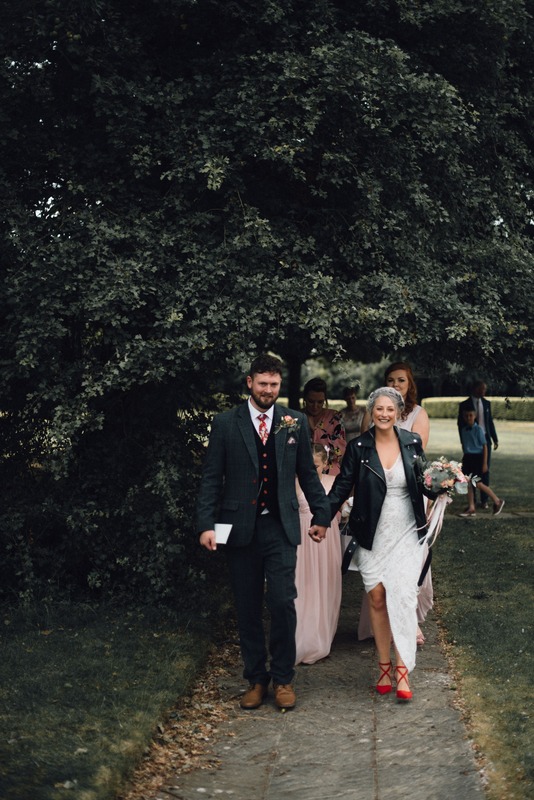 “A friend of mine is a very talented artist who does a lot of graffiti art as well as personalised designs on trainers and other clothing; he kindly painted my leather jacket as a wedding present. 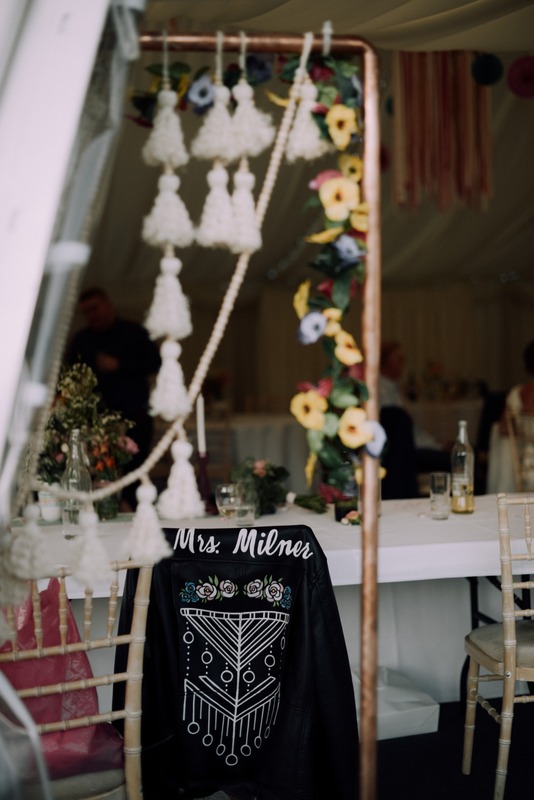 We worked together on the design that included a graphic copy of the macramé hanging we had behind the top table, along with ‘Mrs Milner’. 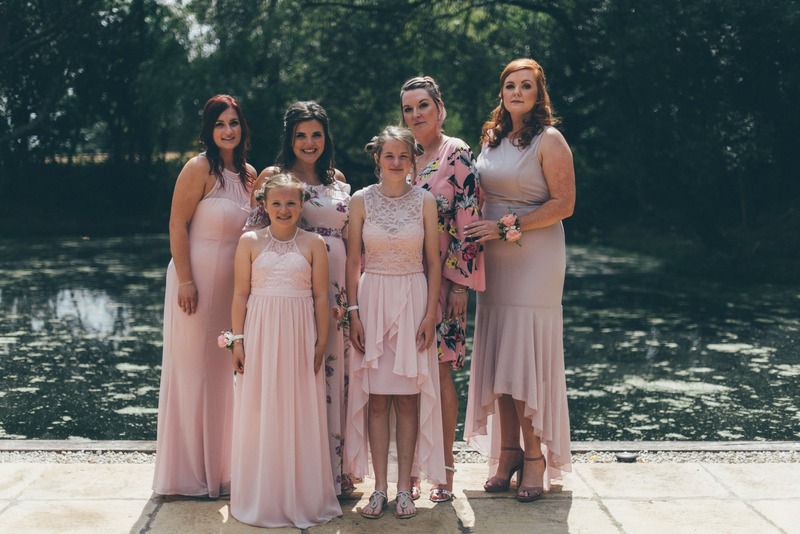 “We supplied our own drinks at Wethele Manor, so bought some giant galvanised steel tubs and filled them with ice, beers, ciders and soft drinks. 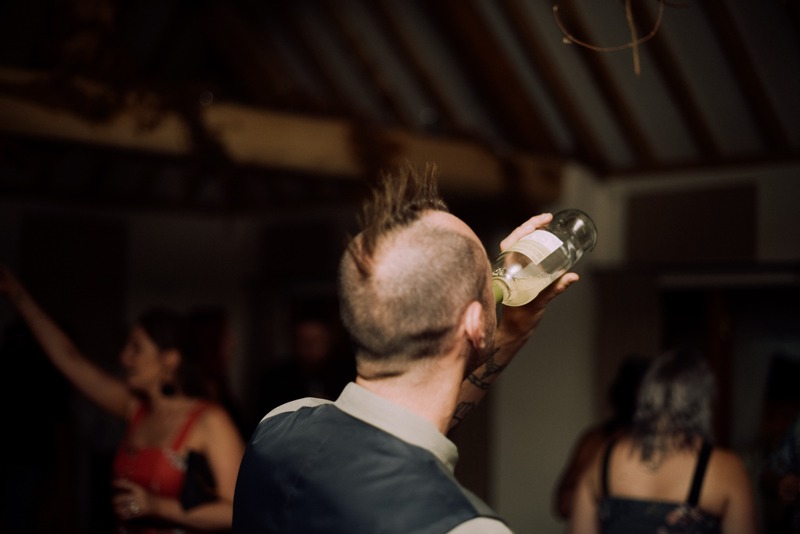 We also collected a whole mix of gins and put on our own gin bar where guests could pick their mixers and garnishes. 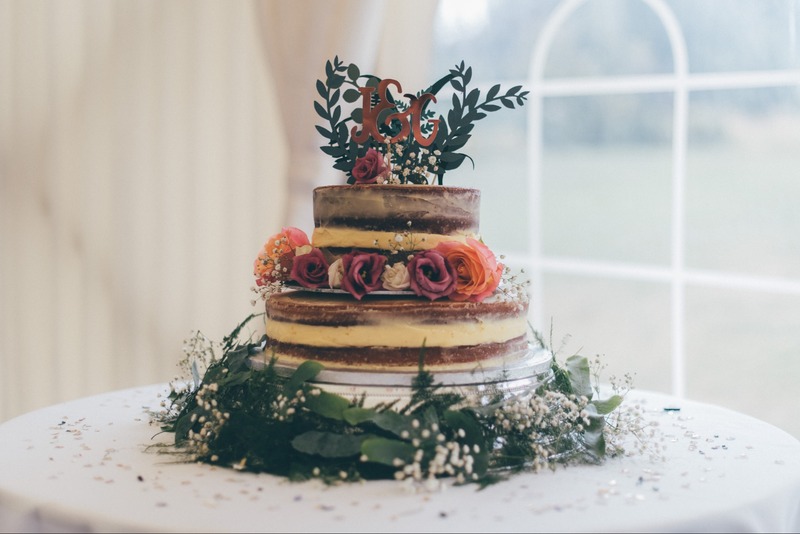 “Our wedding cake was a semi-naked wedding Victoria sponge decorated with fresh flowers. 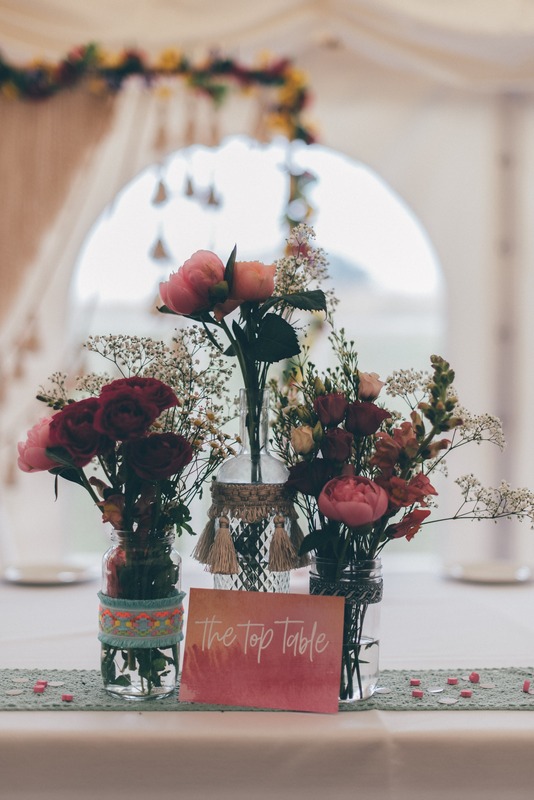 The cake was made by a friend of ours who is extremely talented and didn’t stop at that main show piece – she also made a whole desserts table of goodies for our guests including; gin & tonic cake, mini scones and stamped biscuits.